Today’s websites are designed to be well organized, mobile-friendly, and accessible to those using adaptive technologies, but many never stop to think that our choices when creating a form to collect information from our users may present a problem. What’s the issue? The all-too-common tendency for web forms to ask for a First Name and a Last Name, such as “John” and “Smith,” but provide no Full Name or Preferred Name field for those whose names don’t fit this First+Last pattern. This First and Last Name convention may fit the majority of cultural and personal expectations for those in the United States, but expand your audience to those born or with family roots in other parts of the world and multicultural sensitivity comes into play. We can accommodate everyone with a little foresight and simple adjustments. 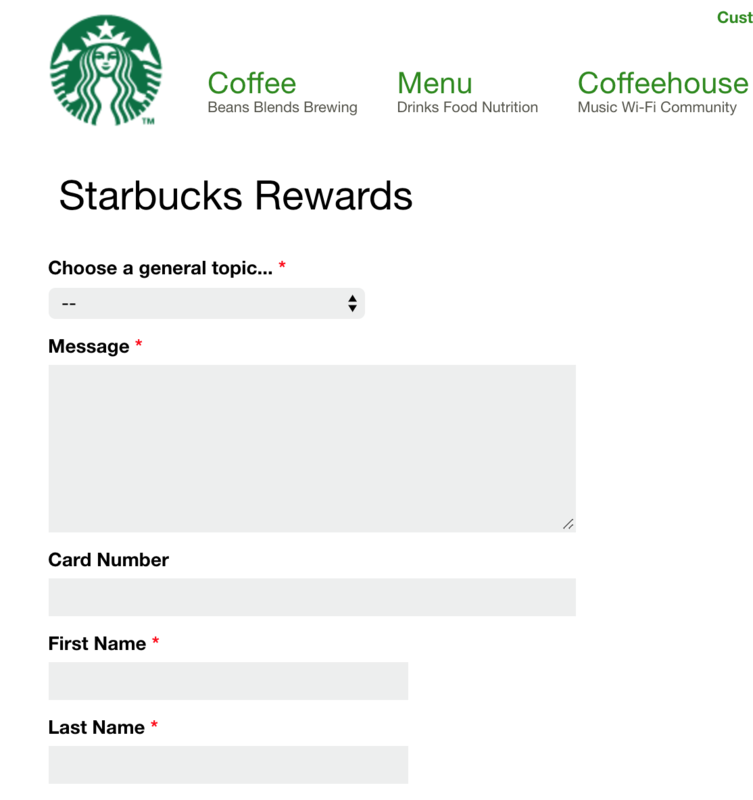 Even large, well-known companies like Starbucks lean on First Name-Last Name conventions, even when it’s not required for payment processing. Organizations try to get clever with the information collected about visitors, especially with today’s ease of personalization. We want to be able to say “Dear John,” or “Greetings to the Smith family,” but this personalization only works when a user’s personal preferences are considered. The trouble begins when a person may have or prefer to use one name (Madonna and Beyonce are examples from pop culture) and will be frustrated on the requirement to enter both “First” and “Last” fields. More common are people who have three-part, four-part, or even five-part names and have no good way to shoehorn those into these two fields. Templates, off-the-shelf modules, and unwritten standards based on commonality in others’ designs create a tendency to not think broader and has spread the issue around the web. It also can be complicated by legal requirements, such as those for payment processing, though often our contact or lead forms don’t have these requirements. The only true solution is to ask people to provide their name. Not arbitrary bits of their name, but their whole name. Reliably identifying a contact correctly and uniquely is reason enough to let people provide their whole or preferred name. In a home or office where perhaps there’s a John Adams and a John Quincy Adams, addressing mail to the right one will avoid confusion. Even if they might be able to figure it out on receipt, a donor or event registrant should not have to distinguish themselves from a similarly-named colleague. These examples may sound uncommon, but I experienced one department at Cornell University with two people named John Parker. Tell them they aren’t allowed to identify themselves more specifically than that, and you’re not going to get very far. These employees would not only want a preference to distinguish themselves but need one to avoid confusion. 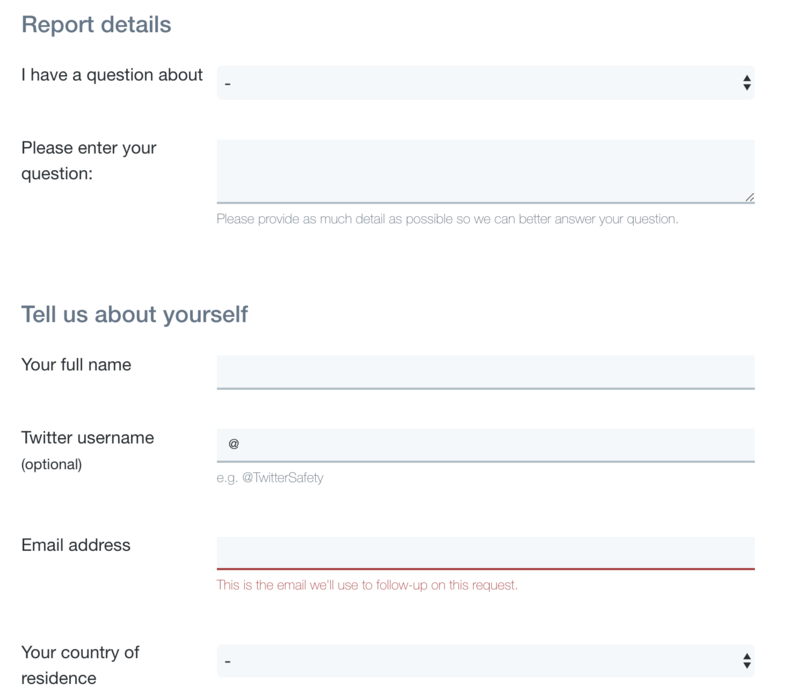 A contact form on the Twitter website shows how Full Name fields can be used. Simply adding the middle name field isn’t an ideal solution either, even if it’s not a required field. It handles me, and John Quincy Adams and James Earl Jones, but not Ella Marija Lani Yelich-O’Connor, who you may know as the singer Lorde. This approach also fails for Nguyen Ngoc Kim Khoi, a Vietnamese friend of mine. (Never mind that Nguyen is his family name, not his given name, so an automated “Dear Mr. Khoi” could look insensitive.) Four-part names are very common in Vietnamese- and Arabic-speaking families, as well as many other cultures as well. Character limits in name fields often create difficulty for our users from these cultural roots as well as those with hyphenated names such as Joseph Alberic Twisleton-Wykeham-Fiennes, more commonly known as the actor Joseph Fiennes. Would your Last Name form field allow for 25 characters (not to mention the special characters)? There are still valid reasons to ask for bits of people’s names. 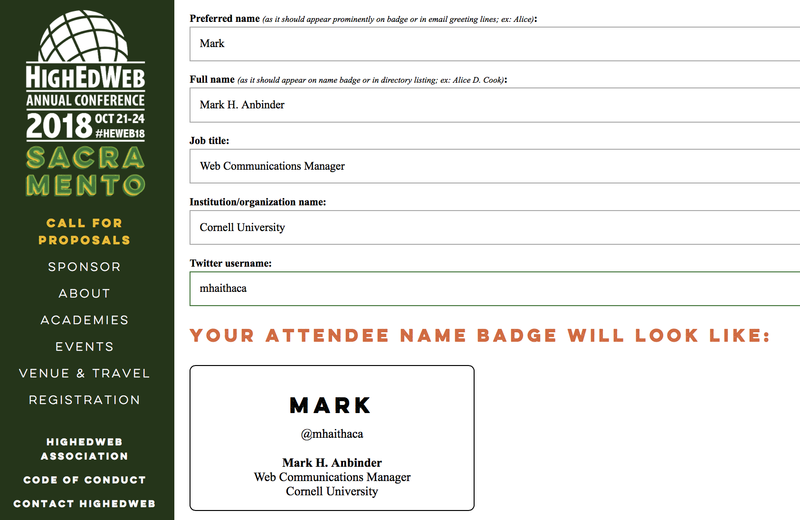 It’s nice to be able to say “Dear John,” or to show a conference attendee’s given name prominently on a name badge. The HighEdWeb conference provides a great example solution by asking for a full name and also ask for a preferred name for greetings. In addition, the form provides contextual help text through examples (“ex. Alice” for the preferred name and “ex. Alice D. Cook” for the full name) to make it clear what they’re after, and why. The HighEdWeb registration form asks for both Preferred Name and Full Name and shows a sample of how these will be used on the conference badge. Additionally, our validation scripts should be as permissive as possible. Warn people not to use backslashes in their names if they’ll genuinely interfere with your underlying database code, for example, but don’t refuse apostrophes or you’ll be turning away Scarlett O’Hara and M’Lynn Eatenton, and don’t deny hyphens. The good news is that very little needs to change behind the scenes to make this work. Whether it’s repurposing an existing First Name database field for a Preferred Name that’s worth capturing or just adding an additional field that allows for the needed personalization, these are often quick and easy changes and make your user experience more inclusive. If you’ve got forms that ask for First Name and Last name, and so many of us do, I hope I’ve given you some good reasons to make some changes and some good ideas of how to go about it.